Don’t look it directly in the eyes. Nobody knows exactly what will happen if you do, but it’s definitely bad. This 1990 Nissan Autech Zagato Stelvio is already angry, and it might just body slam you into the floor if it thinks you’re disrespecting it. It’s put up with nasty remarks about its aesthetic deficiencies for years, and it decided that enough was enough. Be kind to it, and it will be kind to you. Zagato is known for gorgeous designs, and when it decides to pen something that isn’t exactly beautiful, it goes for striking. Striking is exactly what this Nissan is. With this one, Zagato cribbed from their own Aston Martin V8 Zagato and Alfa SZ looks, and somehow I still think it works. It’s also incredibly rare, as only 104 units were built. Autech is known primarily for tuning luxury and sporting models of Nissan’s lineup for decades, even modifying some for people with disabilities to fit into their everyday lives. They’ve built everything from long wheelbase Cedrics to the engines for Nissan’s Super GT efforts. 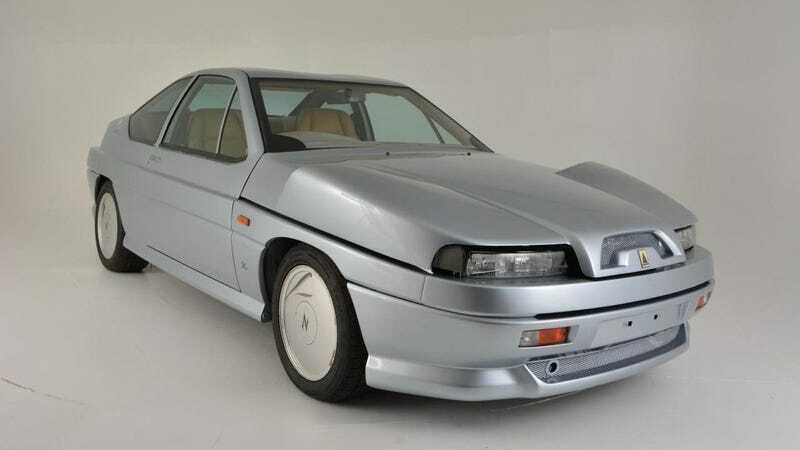 For this Zagato-bodied wonder, Autech built a chassis (based on modified Nissan Leopard bones) and tuned up a high-horsepower version of Nissan’s 3-liter VG30DET turbocharged V6 to power it. Zagato handled the body. Those weird bulges to either side of the hood? Those are fender mirrors. It’s got NACA ducts on the frickin’ wheels! It cost more than a Honda NSX-R at the time. It’s the most bubble-era Japanese thing I think I’ve ever seen, and I want it desperately. As luck would have it, this one is for sale currently on eBay with a buy it now price of $49,500. To sweeten the pot, if you drive this thing to a Radwood you’ll definitely win a Raddest in Show trophy.